When Should You Get Your Puppy Neutered? Medically, I don’t really know when you should get your puppy neutered. I don’t have facts as to why it’s better to get your puppy neutered earlier or later. What I am going to tell you is my experience with spay/neuter and hopefully it will help you make an informed decision as well as save you a bit of money. Two days after picking up Archer from his breeder we stopped by the vet for the first time for a puppy wellness checkup. Archer’s breeders had started him on his puppy vaccination schedule, but we just wanted to make sure that Archer was a healthy puppy. It was at this time that our veterinarian first brought up the question: when should you get your puppy neutered? While we’ve heard different opinions from vets, friends, family, and of course the internet our vet did not claim a best age to get your puppy neutered. He said most vets and people recommend getting your puppy neutered at around 6 months of age, but he also said he read research for waiting until your puppy is older as well as research on why you should get your puppy neutered at a younger age. My experiences with spay/neuter over the past 11 years has been all over the board. Linus was my first puppy and the veterinarian at that time recommend he get neutered at 6 months of age and since I considered the vet to be the expert I followed his schedule. On one side, when I fostered puppies for Cuddly Canines they had their pups spayed/neutered immediately. The German Shepherd pups I fostered were probably only about 8 weeks old when they were altered. On the other side, the guide dog school did not have Stetson neutered until he was 10 months old. Canine Support Teams asked me to wait until Adelle was 12 months old before she was spayed. 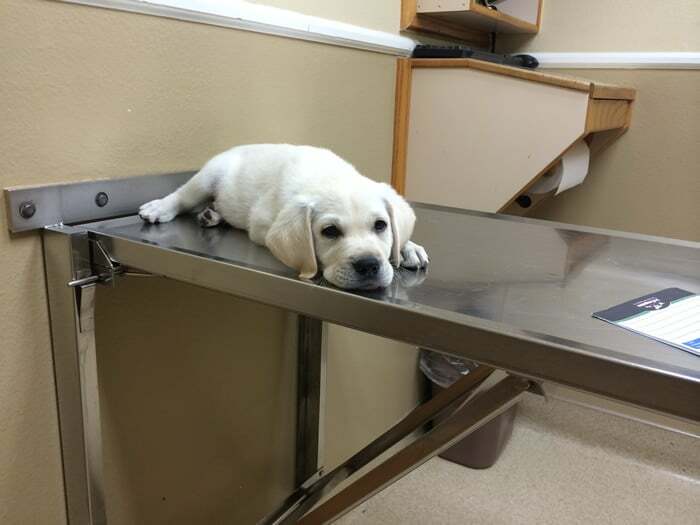 Archer was on a typical puppy vaccination schedule. He received his rabies vaccination when he was 16 weeks old. As a puppy raiser this is a day to celebrate as our puppy is well on his way to developing a healthy immune system and not as susceptible to catching disease. While we do stick to age appropriate outings we are less at risk to illness. However, something else happens after our puppies receive their rabies vaccination. According to the clerk at OC Animal Care federal law requires veterinarians to report when a puppy receives his rabies vaccination. When Did I Get My Puppy Neutered? Armed with 11 years of puppy raising experience I was confident that I knew what to do when getting Archer neutered. My original plan was to get Archer neutered when he was 6 months old, but that would have put him in a cone during our wedding which wouldn’t have been good for pictures and if there were any complications would not have been convenient while planning and prepping for a wedding. Instead I waited until after the wedding when Archer was just under 7 months old. We’ve always gotten our puppies licensed. Our pets (Linus and Stetson) received regular pet licenses from the Irvine Animal Care. My guide and service dog puppies received special service dog tags from Irvine Animal Care at no charge. Today, I went in to renew Linus’ license and get a service dog tag for Archer. Unfortunately things didn’t go as planned. No problem with Linus, $27 for his yearly renewal. The problem was when I went to get a service dog tags for Archer. First of all, let me preface with I received a letter from the OC Animal Care for both Linus and Archer at the beginning of the month (a couple days before my wedding). Linus’ license was $27. However, Archer’s license was a whopping $100! Archer could have received a puppy license for $27, but he had to be registered between 4-6 months of age and it would have lasted until he was 12 months. Can I register him as a puppy? No, because he’s over 6 months of age. I never received a letter for a puppy registration nor had I ever heard about puppy registrations. Can I register him as a service dog? No, because he has to be registered with his partner. Since he is a service dog puppy in training he does not yet have a partner. But he’s neutered, can I register him as an altered adult? No, because he wasn’t registered before he was 6 months of age. It’s all very confusing and I’m surprised that OC Animal Care won’t help me out considering I’m putting a lot of my time, effort, and money into raising/training a service dog to help my community. I can’t help, but feel that these strict rules on service dog tags at OC Animal Care are a direct result of people parading their dogs around public places like restaurants, shopping malls, bookstores, etc as “service dogs”. While I could sign off on a document saying that Archer is my service dog. I’m not going to do that because it’s not the truth. I’m training Archer to be a service dog for someone else. Option #1 – After getting Archer his rabies vaccination I should have gotten him a puppy license which would have cost me $27. This would have given me until Archer was 12 months old to get him neutered. I would have saved $73. Option #2 – I should have gotten Archer neutered before he was 6 months of age. This would have brought his license registration down to $27 which is the amount for an altered adult dog. Again I would have saved $73. Your city or county may have different rules then we do out here in Orange, CA. Back when we lived in Irvine they had no problem giving Stetson and later Derby and Dublin a service dog tag. However, that was over 6 years ago and times a change. Hopefully this helps answer the question when should you get my puppy neutered. If anything I hope it helps save you a little money. As I mentioned I know every city/county is different. Tell me about your experiences with spay/neuter and licensing in the comment section below. UPDATE: At 9 weeks old I took Charlie in for his first vet appointment. Our veterinarian gave Charlie a thorough exam, vaccinations, and we had a short discussion about when would be the appropriate time to neuter him. This was the first time we had a vet tell us to wait until our puppy was at least 12 months old before getting him neutered and if possible wait even longer. He told us that 4-5 years ago he would have told us differently, but because of recent studies it was a good idea to try and keep your puppy intact as long as possible. Good for our veterinarian for keeping up to date on the most recent studies in animal care. I think it’s horrible (and, also, very American) to have your dog neutered at a very early age. It’s like neutering a child. Your dogs body has not finished developing yet, you should wait for that to happen (1,5 – 2,5 years of age) before even thinking about getting your dog neutered. There’s plenty of information on the internet about this. I might not even get my dog neutered, unless medically necessary. Thanks for stopping by. Since posting this information earlier this year I’ve been talking to vets, dog trainers, and other experts and I’m finding very mixed opinion on the subject. However, at this moment I am in agreement with you on waiting until later before thinking about neutering. Another option that I’m going to look into is sterilization instead of spay or neuter. If you have any links to relevant information on spay/neuter please share with us as I’d like to learn more on the subject. I’ll likely start researching this subject in the next few months since I’ll have to make this decision again very soon. However, as of right now I’ve only spoken to a handful of trainers and vet techs who are for sterilization vs spay/neuter. I’m going to have a chat with my vet next time I’m in the office. Let me know if you find any new information on this subject.